A Chautauqua Lake Erie New York Vacation Rental near Chautauqua Institution in the center of Lake Erie Wine country, all 25 wineries within 20 miles, offering two to four spacious suites each with large modern Kohler baths, fine antique furnishings and great architecture coupled with modern amenities. We have a special price for a special place that allows you the opportunity to do it your way with the privacy of a whole house rental for two, three or four couples. Enjoy with us more of Chautauqua County, its people and businesses. 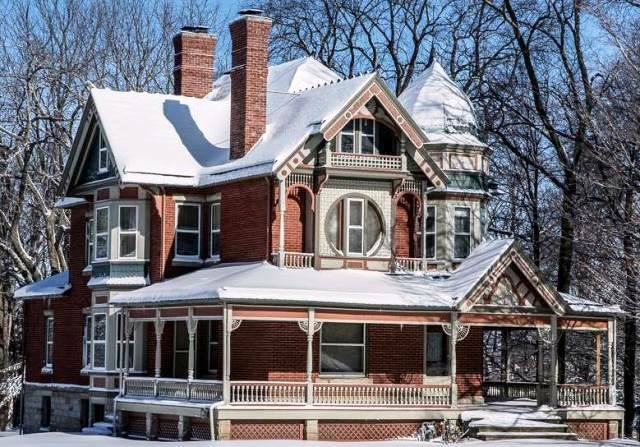 The Captain Storm House is a large brick Queen Anne revival home built in 1892 by a northwest coast retired sea captain who enjoyed both Lake Erie and Chautauqua Lake. This special home was designed by the nationally known architect George Barber. 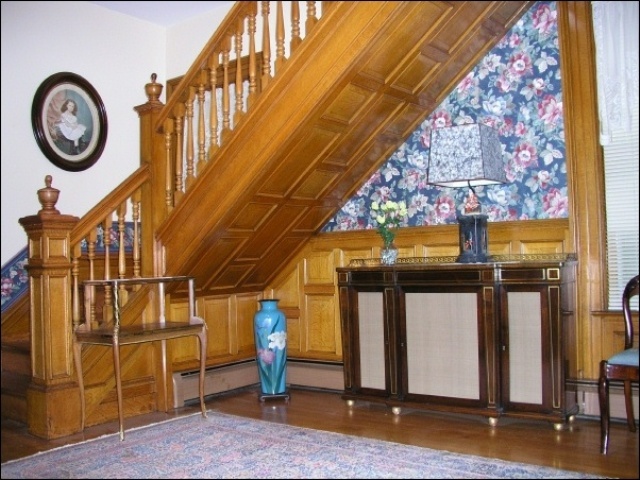 The Captain Storm House is not only important from the outside with its unusual sweeping architecture, spacious porches and detailed appointments, but also has a wonderful interior. The Captain Storm House has paneled walls, pocket doors, coffered ceilings and two carved fireplaces with each of the main rooms of the Inn displaying a different light figured wood - curly cherry, sycamore, quartered oak, chestnut, figured maple and pine. The Captain Storm House requires a two night minimum for a two to four suite rental of the house. A special private getaway with four large private suites, each with queen size beds, sitting areas, and large Kohler garden tub and shower. The Captain Storm Suite features a large double Kohler Whirlpool and shower (175 sq. ft. bathroom). All rooms in our vacation getaway are furnished with many elegant late 19th century/early 20th century antiques - Victorian, Art Nouveau, Aesthetic Movement, Arts and Crafts and Oriental. The Captain Storm House has DirecTV with premium channels, wireless and AC in each of the bedrooms. 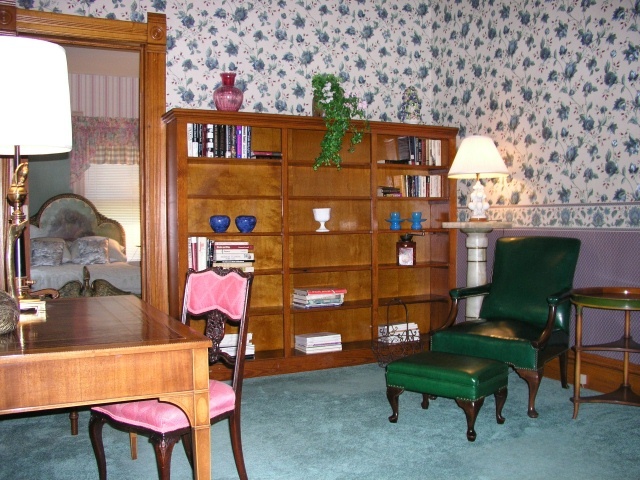 Guests may use the large country fully equipped kitchen, formal dining room, library and two parlors. The 85 foot sweeping wrap around front porch is wonderful for enjoying most evenings. There is also a small private back porch high in the trees perfect for more intimate settings. 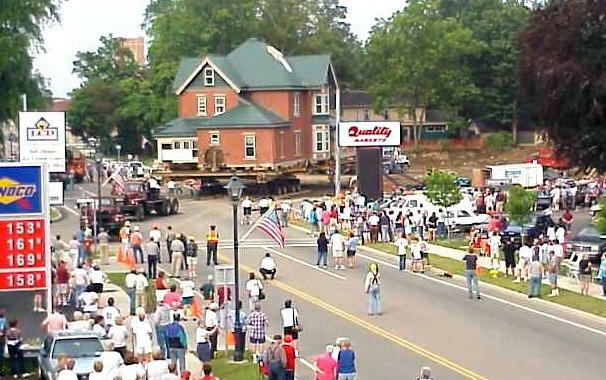 Notice a picture of the Captain Storm House moving down Main Street from two blocks farther West in 2000. 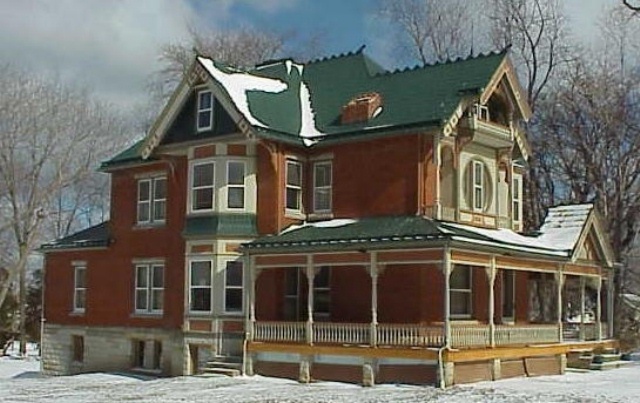 Through the efforts of the National Historic Trust, the State Preservation Offices in Albany and the Landmark Society of Chautauqua County, Western New York we were able to save from demolition a nationally important historic home designed by one of the most well known and successful national residential architects, George Barber. 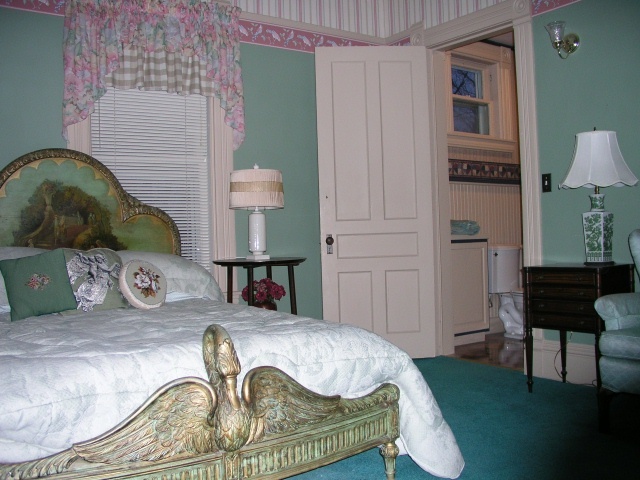 The Captain Storm House was moved in 2000 to Candlelight Lodge bed and breakfast property, restored and opened in 2004 as a B&B on two landscaped acres in the heart of the village of Westfield, New York. The Captain Storm House has a special consideration and importance with its listing on the National Register of Historic Places. Our convenient location allows guests of the Captain Storm House to walk to the Village Park and shops. Within one block are convenience stores, banks, a full service grocery store, fast food, wonderful restaurants, medical center, post office and pharmacy for additional needs. Within a few short blocks is also Westfield Memorial Hospital, the Chautauqua County McClurg Museum and the Patterson Library which houses the Octagon Art Gallery. Each of these buildings are architectural wonders offering the history of Chautauqua County and its oldest community, Westfield. Five miles south is Mayville, NY on Chautauqua Lake with Chautauqua Institution (15 minutes) only a few more miles. West, one mile on Route 20 from the Captain Storm House is the New York State Grape Discovery Center with history on the largest and oldest concord grape growing area in the world. The Discovery Center offers tastings and gifts. 25 wineries are located along the Chautauqua Lake Erie Wine Trail (40 miles). All 25 wineries are within 20 miles. Five major wineries with wine tasting are within four miles of the Captain Storm House. One mile west of the Captain Storm House on Route 20 is also our Landmark Acres Antiques, a fine quality antique shop since 1946 offering "special pieces for special places". There is a Farmers Market in the Village Park, two blocks away from the Captain Storm House on Saturdays during the summer. There are bike trails and hiking along Chautauqua Gorge. Many special events such as the Westfield Arts and Crafts Festival, the Westfield Antique Show and the Art Trail Open Studio Tour occur in July. There are seven Special Wine Weekends throughout the year. Many fine choices for dining can also be found within a few blocks to a few miles. Enjoy Lake Erie's Barcelona Harbor and Pier with the oldest natural gas Lighthouse in the country built in 1829. Barcelona and Interstate 90 are each one mile from the Captain Storm House. As the only safe harbor on Lake Erie for many miles Barcelona is one of the principle reasons for the large number of wonderful 19th century homes in Westfield. Successful 19th century businessmen in Jamestown needed supplies for their nationally known furniture factories. Westfield businessmen built themselves grand homes from supplying many of these needs overland to Jamestown. Westfield New York is also the original home of Welch's Grape Juice. Travel around Lake Chautauqua, five miles away from our Captain Storm Vacation Rental. Take a dinner cruise on Lake Chautauqua or visit Chautauqua Institution, 15 minutes. Chautauqua Institute is known around the world for its summer cultural programs with concerts, lectures and famous international entertainers. In nearby Fredonia NY (16 mi.) is SUNY at Fredonia and the Fredonia Opera House. Jamestown NY (25 mi.) has the Lucy-Desi Museum, the Roger Tory Peterson Institute and Audubon Nature Center and Sanctuary, the Fenton Museum and the Robert Jackson Center. There is also Lily Dale on Cassadaga Lake 20 miles away. The Captain Storm House requires a two night minimum for accommodations. A special Vacation Rental price allows three or four couples the exclusive use of a private home. If you choose two suites you may be able to add a third or fourth suite at a reduced price before your arrival. You will reserve exclusive use of the whole house with a three or fourth suite reservation. With "Whole House Rental" there are special rates and restrictions, please see Captain Storm House Policies below or Special Packages. For example, the "Whole House Rental" by the week is exempt from NYS Sales Tax (8%) county tax of 5% still applies to stays of less than one month. Directions: Exit 60 Westfield NY I-90. Westfield NY is less than two hours from Cleveland, Pittsburgh, Buffalo, Rochester and Niagara Falls. A Romantic Getaway for all seasons - skiing at nearby Peek 'n Peak, the Ice Castle Festival in Mayville, the Wine Trail - Wine and Chocolate Weekend and other winter sports await you. Double Parlors - carved fireplaces, pocket doors, elegant antique furnishings, formal trim - one sycamore, the other in curly cherry, and many modern amenities. Front hall - paneled oak, pocket doors, early lighting, 19th Century tall case clock and Period Regency side cabinet. The Formal Oak Dining Room - coffered ceiling, paneled walls, pocket doors, gilt bronze chandelier and furnishings from a prominent 1890 Jamestown estate. 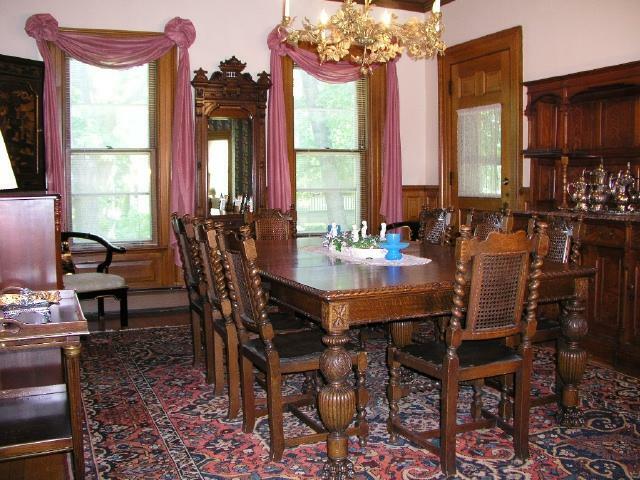 The Captain Storm House has a fully equipped country kitchen, formal dining room, library and double parlor each with a fireplace and special woodwork. Each of four suites has a large modern Kohler bath for total privacy. The Captain Storm House has a large wrap around front porch and a small private back porch high in the trees for sunsets - a wonderful getaway vacation rental for up to 8 people. If you choose the two suite option you should select at the time of your booking which suites you prefer. Each has its own special charm. We offer the Captain Storm Suite with Jacuzzi (2nd floor), the Parisian with adjoining library on the main floor or the Empire and the Federalist Suites (2nd floor), all with exquisite furnishings and special Kohler private baths. 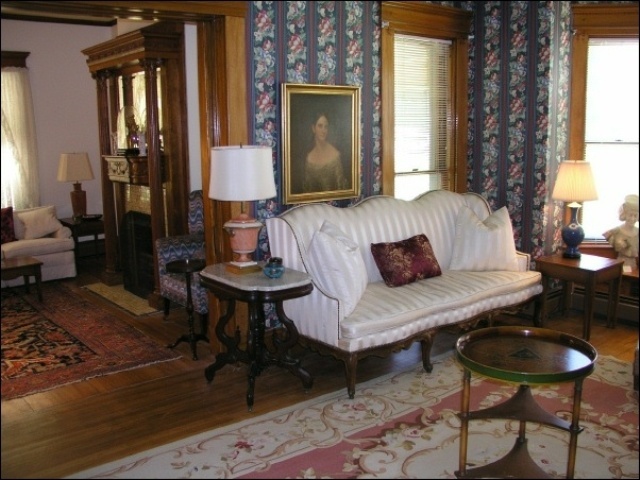 A spacious suite with Civil War carved Victorian queen size three piece marble top bedroom set, rare early lock side tall chest, elegant Renaissance library table, DirecTV with premium channels, AC, wireless and large bay window await you. Luxurious bathroom ( 175 sq. 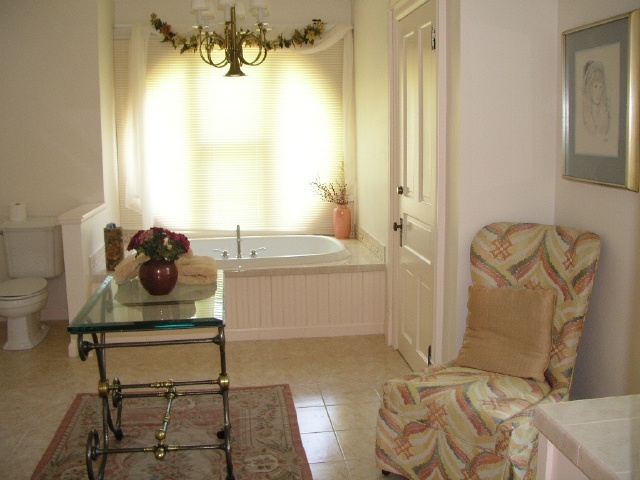 ft. ) - large Kohler double Whirlpool, corner shower, large round architectural window, tile floor and French vanity. Interesting 19th C. French accents decorate the two rooms. First floor, three rooms - bedroom, private library and bath, DirecTV with premium channels, AC, wireless, carved chestnut woodwork, custom queen size carved Napoleonic bed with full hand carved swan on footboard and hand painted scene on headboard, 19th C. French and Chinese accents and Bostonian Federal inlaid desk, large Kohler Garden Tub and Shower bath. 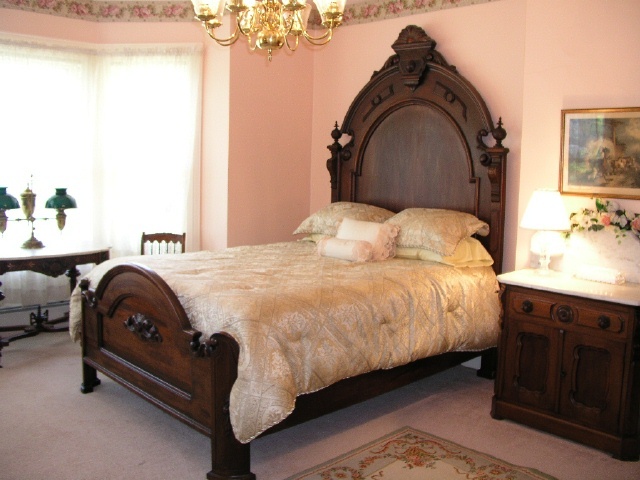 A queen size carved mahogany French bed, Persian rug, bombe chest, carved stand and eterge, all mahogany pieces made for New York City elite in 1890, AC, large Kohler Garden Tub and Shower bath. A queen size carved mahogany four poster bed with 19th C. Federal Bostonian lamps and stands, lady's writing desk with marble top chest and early French country accents, AC, large Kohler Garden Tub and Shower bath. Breakfast not included in Vacation Rentals - breakfast can be added for an additional $15 charge per couple per night for an $18 certificate. This certificate is accepted at three different local restaurants for breakfast or lunch. As a Vacation Rental no services are supplied. Still we offer mid week maid service for weekly rentals. All rentals require a 5% County Occupancy tax. There is no New York State sales tax of 8% on weekly Vacation Rentals. Please remember if you choose two or three suites you may be able to add an additional day or suite at a reduced price before your arrival. Please note our cancellation policy on the Candlelight Lodge B & B Policies Page if needed for additional information. Reservations and deposit must be made by one responsible person for the whole Captain Storm House with final payment by the same party. We accept credit cards, Visa or Master Card. Balance by Check or Cash is preferred to save a 3% credit card charge at the end of your stay. No additional charge for deposits. Over your stay, reservations at the Captain Storm House are for a maximum of 8 guests. Arrangement must be made in advance before your stay for the number of visitors. Arrangements for entertaining and their numbers must be made in advance. No more than 20 people total may use the facilities at any one time. Special furnishings, consideration for neighbors and local ordinances are important. Over the years we have also found that smaller groups easily become much larger gatherings, perhaps because of our visibility on Main Street. Children over 14 are welcome and counted as guests towards a maximum of two people per room, four rooms, sorry no pets. Children over 14 still require adult supervision. Smoking is only permitted on outside porches. We reserve the right to later charge your credit card for any losses or damage beyond normal wear incurred during your stay. Check - in is between 2 PM and 6 PM otherwise please make arrangements in advance. Please No Check - ins after 8 PM and call 30 minutes before your arrival.